Triple Eight’s Red Bull Holden Racing Team entries have won the teams’ championship with an event to spare? Triple Eight’s Mark Dutton says that winning the teams’ championship is a great source of pride for the team, particularly in light of the introduction of the ZB Commodore. The Red Bull Holden Racing Team entries of Jamie Whincup and Shane van Gisbergen locked up the title at the ITM Auckland SuperSprint, reclaiming the mantle from Shell V-Power Racing and thus also the first garage in pit lane after one season. It is Triple Eight’s ninth teams’ championship, the first of which it claimed in 2008, and comes in the year in which the group became the most prolific Australian Touring Car Championship/Virgin Australia Supercars Championship race winners. “It’s a massive achievement considering who you’re up against,” Dutton, the team manager, told Speedcafe.com. “There are lots of quality teams up and down pit lane, not just the main rivals that are fighting it out now. The triumph comes in the first year of the ZB, for which Triple Eight Race Engineering was responsible for homologation and construction of panels, of which there was a shortage at the start of the season. 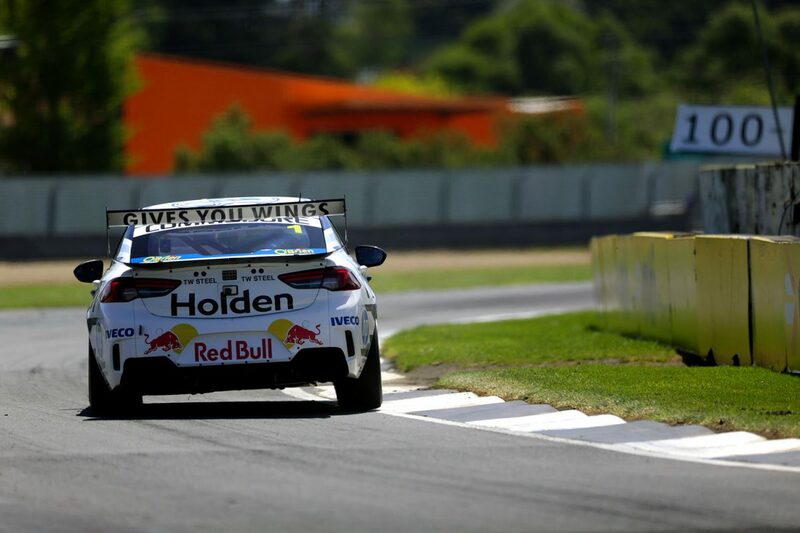 They all but put that behind them in the first race weekend of the year as van Gisbergen pulled off another double pole-to-win in Adelaide, and Holdens filled five of the six podium positions in the city in which the marque was born. “It was a massive task, and then to roll out quick,” noted Dutton. Half of the 28 races completed to date have been won by Triple Eight, including both of the traditional enduros, and it now finds itself 681 points ahead of DJR Team Penske with a maximum 576 achievable across two cars in Newcastle. The Banyo squad won five of the first eight races of 2018 before DJRTP hit its stride, but momentum swung back to Triple Eight in Townsville. It romped home at the Rabble.Club Sandown 500 as Whincup and Paul Dumbrell led a relatively easy podium sweep, before Craig Lowndes and Steven Richards won the Supercheap Auto Bathurst 1000 in former’s final year as a full-time driver. Van Gisbergen won Saturday’s Race 28 at Pukekohe before the team finished two-three-four in Race 29. While Erebus Motorsport has stuck its head up at various times and might have won the Great Race again but for David Reynolds’ leg cramps, Scott McLaughlin has been the main thorn in Triple Eight’s side and DJRTP is now secure in second position in the teams’ standings. Given that a maximum of two cars are considered ‘teams’ for the purpose of the exercise, Triple Eight is also the benchmark in terms of single-car teams with Autobarn Lowndes Racing ninth, ahead of Nissan Motorsport’s #23 and #78 entries and Tickford Racing’s #6 and #56 cars. Tickford’s #5 Bottle-O and #55 Supercheap Auto entries look likely to finish third, however, as the Campbellfield outfit did last year with Cars #5 and #6 before rearranging its garage allocations for 2018. Fourth position is a closer run thing between Brad Jones Racing’s #8 and #14 cars, Erebus, and Walkinshaw Andretti United, a contest which will come to a head at the Coates Hire Newcastle 500 on November 23-25.